Tens of thousands of Lebanese opposition supporters on Sunday demanded Hezbollah be disarmed as they rallied to mark the sixth anniversary of a popular uprising against Syrian troops in the country. "The people want the fall of arms," the demonstrators chanted as they poured into to Martyrs' Square in central Beirut amid tight security, waving the national flag and the banners of pro-Western political parties. "We are here to say yes to life and no to their arms," said Adnan Antar, 65, who traveled from the northern port city of Tripoli to attend the rally with his family. "There can be no rule of the state in Lebanon as long as there is the rule of arms," he added, referring to the arsenal of Shiite militant group Hezbollah. 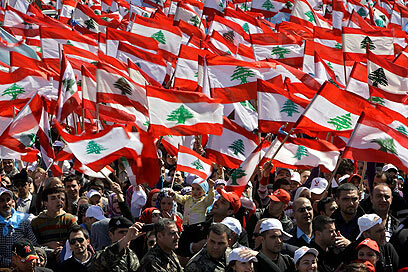 Security forces were deployed across the country, as convoys could be seen heading to the capital from the north and east, blaring songs and displaying pictures in support of former premier Rafiq Hariri, killed in a massive bombing on February 14, 2005. The Hariri assassination saw the rise of a US - and Saudi-backed alliance that became known as March 14, named after a day of massive anti-Syrian protests dubbed the "Cedar Revolution." Combined with international pressure, the protests in the weeks after the killing led to the pullout of Syrian troops from the eastern Mediterranean country in April 2005, ending a 29-year deployment. Major highways leading into Beirut were blocked with traffic as supporters of Lebanon's opposition - led by Rafiq's son, outgoing premier Saad Hariri - began to voice concerns of infiltrators at the rally. The rally this year comes as Hezbollah's military might is once again thrust into the forefront of a deadlock between rival Lebanese camps. Leaders of the "March 14" opposition camp joined the crowds on Sunday to address the crowd. "We will not accept that our fate be in the hands of others nor will we accept a state within the state," said Christian leader Samir Geagea, head of the Lebanese Forces party. "We will not accept that the Lebanese economy continue to be paralyzed... nor that our history be distorted," he told the cheering crowd, adding the rally was an "attempt to pull Lebanon once again from the quagmire". "We say no to the exploitation of Lebanon for the benefit of Iran," Hezbollah's main backer, said Geagea. Several demonstrators on Sunday carried banners reading "NO to the dictatorship of arms" and "God has no arms," in reference to Hezbollah, Arabic for "Party of God." "The fight for them to give up their arms has been political so far... but we will not stand by as witnesses who fear their reaction which could turn violent," said Salim Eid, 46, a supporter of the Christian Lebanese Forces party. "Let's hope they don't have a violent reaction to this rally here today." Lebanon's opposition has accused Hezbollah, the only party not to have turned in its arms after the 1975-1990 civil war, of having used its arsenal to intimidate MPs into voting against Hariri's re-appointment after his unity cabinet collapsed. The March 14 camp also accuses Hezbollah of using its arms during the events of May 2008, when a protracted political crisis culminated in one week of street clashes that killed 100 people. 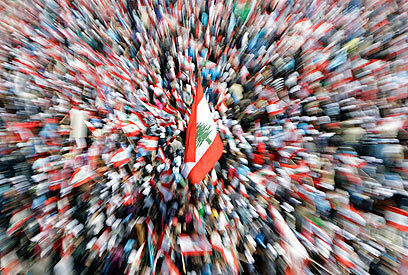 See all talkbacks "Tens of thousands mass for Lebanon pro-West rally"